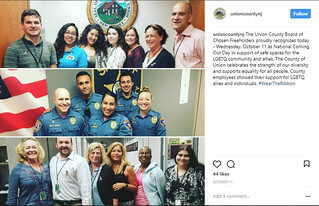 For the 16th year, the LGBT Network marked October 11th, National Coming Out Day (NCOD) with its #WearTheRibbon NCOD campaign. It was the first time in the campaign’s history that the LGBT Network has expanded its efforts beyond schools and it was a resounding success! With nearly one quarter of a million participants form over 220 companies, schools, unions, libraries, sports groups, elected officials, colleges and universities, and other community organizations participating, it was the largest community organizing effort the LGBT Network has ever launched. The goal of the LGBT Network NCOD Campaign was simple: Engage and empower the greatest number of people to take a stand against discrimination, violence, harassment, and bullying of LGBT people by coming out for safe spaces where they LIVE, LEARN, WORK, PLAY, and PRAY. This year’s campaign expanded well beyond the borders of the New York Mero area, as groups from across the country participated, including eBay locations in San Jose, CA; Houston, TX; Salt Lake City, UT, and Hartford, CT; GEICO in Arizona, a college in Canada, a church in South Carolina, a high school in Minnesota, 21 Northwell Health locations, and nearly 100 more non-school groups. “Today, the LGBT Network’s National Coming Out Day campaign is truly national.” said Kilmnick.